How Does Giving Away Free Kindle Ebooks Sell Ebooks? Free Kindle ebooks sell ebooks in the end through a complex algorithm that Amazon uses to calculate an individual ebook’s sales rank. In simple terms, each free ebook that is downloaded counts towards the ebook’s sales ranking. Amazon does not give precise details on their Free book promotions page, apart from this broad explanation. In the very early days of Kindle Direct Publishing, one free ebook carried the same sales weight as a paid sale. This created a silly situation where you could become a bestselling author overnight without selling a book. This was changed quite quickly, however, and over time, the value of a free ebook against a real sale dropped to 50% and then later to 10%. Unfortunately, Amazon does not give precise weighting percentages now in their help pages. Well, not that I could find anyway. All I could find was this brief mention regarding the effect of Kindle free ebooks on sales ranking. With so little hard information to go on, understanding how Kindle free ebooks sell ebooks is difficult to calculate. The only measure I have been able to rely on to any degree is my own overall Author ranking on Amazon, which always seems to fluctuate in line with the number of ebooks that I give away free of charge. Of course, I can only use Kindle free ebook promotion if I have my book listed in KDP Select. In the graph below, it is very clear that I enrolled in KDP Select in May, and exited in early late October. My ranking dropped immediately at the beginning of November, as did my sales, as soon as I could not offer Kindle free ebooks any longer. Unfortunately, I cannot access this graph over five years, but it would show the other periods when I have had all my ebooks enrolled in KDP Select and the same increase in both ranking and sales during my previous enrollment periods. While it certainly is not hard data that can prove conclusively whether free Kindle books help sell ebooks, all I can say is that from my own experience, they do. As you can also see in the graph above, my ranking nosedived at the end of October. Due to this, I have now returned some of my ebooks to KDP Select. 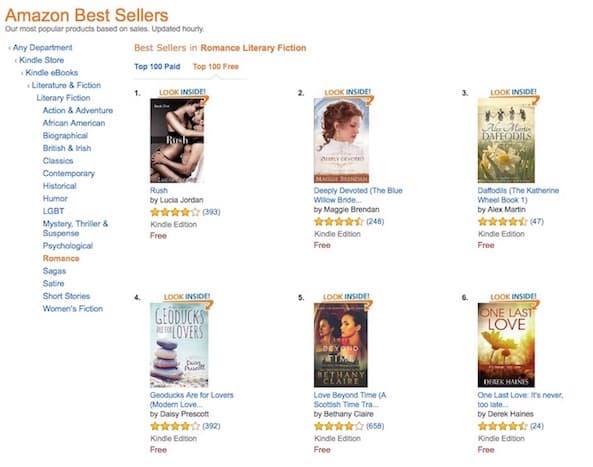 The very first free ebook I offered for free, which was a romance book, ranked very well at #6 in a very competitive genre. This, of course, will boost my ebook’s paid ranking a little when it goes back to paid, which will hopefully lead to real sales. Over the years, my rule of thumb has been that if I can get a free ebook into the top 10 free ebooks in its genre, sales will almost certainly follow. One point to consider, however, is that some genres perform better than others. While self-help, science fiction and young adult ebooks tend to do quite well, memoirs and historical novels may not. Another consideration is that I believe Amazon Prime members can still get one free ebook per month, which may help, but I have no data on this issue. Another factor to consider about free ebooks is the misconception that by giving away an ebook, it is losing a sale. This is not true at all because people who download free ebooks would not have bought it, and quite likely, won’t even read it. But by simply downloading a copy to a Kindle or one of Amazon’s Kindle reading apps, they help give my sales rank a small boost, which in turn helps ebook sales. So yes, it can be a good deal and it is why free Kindle ebooks can sell ebooks. What Is A Domain Name And How Can It Help In Book Promotion? By the measure of #1 0n the free bestsellers, Jack, we have both ‘made it’, many times over! But we are still poor, starving writers. Such is life. My Kindle book has been slapped with the adult content label and I was wondering if this will completely negate any benefit from running freebie days? Will any bump in rankings be masked due to the filter? It shouldn’t make any difference, Andrew. All Kindle sales rankings are calibrated the same way. You can now get around the KDPSelect requirement by republishing your books on Pronoun. You can go free at any point and not be exclusive. It’s a nice option. Pronoun is also owned by MacMillan, so that’s what shows on your author page.